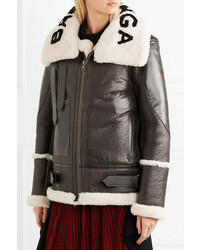 If you're looking for a casual yet seriously chic look, consider pairing a Balenciaga le bombardier oversized shearling jacket with blue flare jeans. As well as totally comfortable, these items look great together. Go for a pair of brown snake leather ankle boots to take things up a notch. 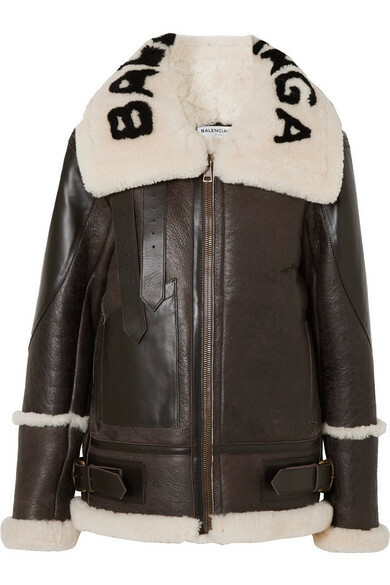 If you're on the lookout for a casual yet absolutely chic outfit, make a Balenciaga le bombardier oversized shearling jacket and black skinny jeans your outfit choice. As well as very comfy, these items look great together. 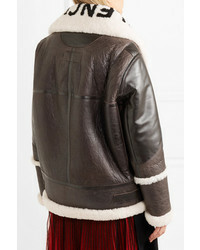 If you're in search of a casual yet totaly stylish outfit, wear a dark brown shearling jacket and a burgundy shift dress. Both garments are totally comfortable and look incredible together. When it comes to shoes, this outfit is complemented nicely with olive suede ankle boots. If you're in search of a casual yet stylish getup, make a dark brown shearling jacket and navy and white check shorts your outfit choice. Both pieces are totally comfortable and they will also look stunning together. Go for a pair of black studded leather ankle boots to instantly up the chic factor of any outfit. 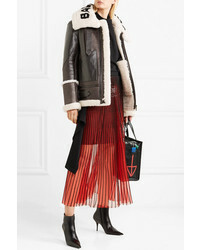 If you're in search of a casual yet absolutely stylish outfit, wear a Balenciaga le bombardier oversized shearling jacket and a black button skirt. These two garments are very comfy and will look incredible when worn together. A pair of black suede chelsea boots will be a welcome addition to your getup. If you're in search of a casual yet stylish outfit, dress in a dark brown shearling jacket and a brown herringbone wool skater skirt. Both of these pieces are totally comfortable and they will also look great when worn together.